I was going to say no new projects for me either, but I did start a new Rainbow Scrap Project, but that was planned, so it's not really a Dreami project. In a holding pattern here, too. One to finish up and one to keep working on! Maybe spring or summer will bring one to me...finish won’t be until tomorrow or Monday but definitely before the 31st! Nuttin seems to be the norm, count me among the. Working on something but it's still in infancy stage. Nice quilt category. I've had a few quilts that come out of the blue and grab me till they're done. I love them - they're usually the most creative. Yes, they will certainly multiply. 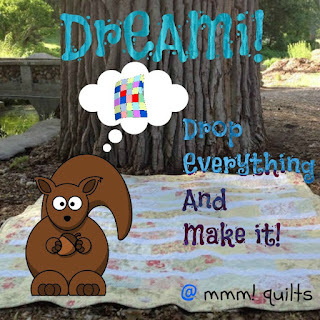 I can't tell you how often I fall in love with one quilt design or another on line and insist on making it.